(March, 2011) USDA Secretary Tom Vilsack recently announced grants were awarded to 68 American farmers and rural small businesses to conduct renewable energy feasibility studies under REAP – the Rural Energy for America Program. “The Obama Administration is committed to helping our nation become more energy independent by helping rural businesses build renewable energy systems,” said Secretary Vilsack. The grants provide assistance for rural small businesses and agricultural producers to conduct feasibility studies for renewable energy system installations. 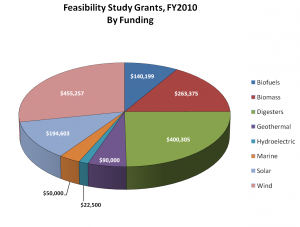 Feasibility studies help farmers and rural small businesses identify ways to cut energy costs and get new clean energy projects in the pipeline. The REAP Feasibility Studies Program pays up to 25% of the costs of the study. 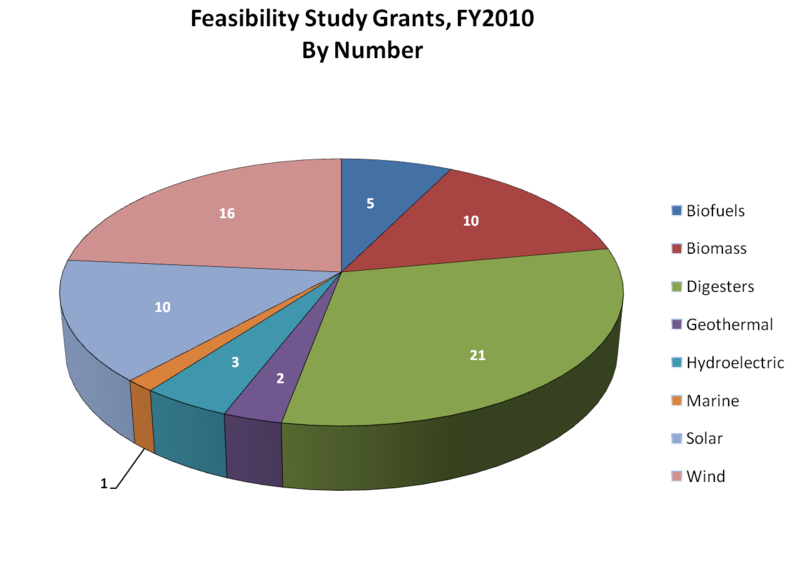 The 68 feasibility study grants totaled $1.6 million and fund studies in 27 states and territories. A number of larger-scale geothermal power projects in the American West were funded, including one for 500 kw and one for 10 MW. Direct geothermal electric technologies have long planning times, where this support makes a big difference. Ohio had the largest number of awards – 10 – for digesters, solar and wind. Click on charts to zoom. ELPC Senior Policy Advocate Andy Olsen visited Billings, Montana in January 2009 to participate in Harvesting Clean Energy’s 2009 Conference. While there, he sat down with Kristi Pettis from the Northern Ag Broadcasting Network to discuss the new Rural Energy for America Program (REAP) (requires Windows Media Player, QuickTime or other media player). Andy emphasized the opportunities for both smaller producers and businesses and larger operations to use REAP’s grants and loan guarantees.